There is something about Halloween that I absolutely love. Everywhere you see delicious treats. That might be it. I am thinking it has to be something else as well. Let’s see…. It is the cute and silly treats! 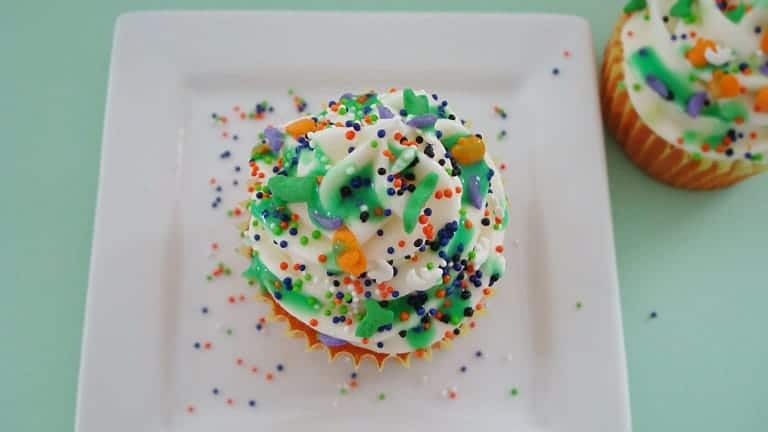 Children think it is the cutest thing when you call your cupcakes slime or if it has slime somewhere incorporated into it, especially boys. 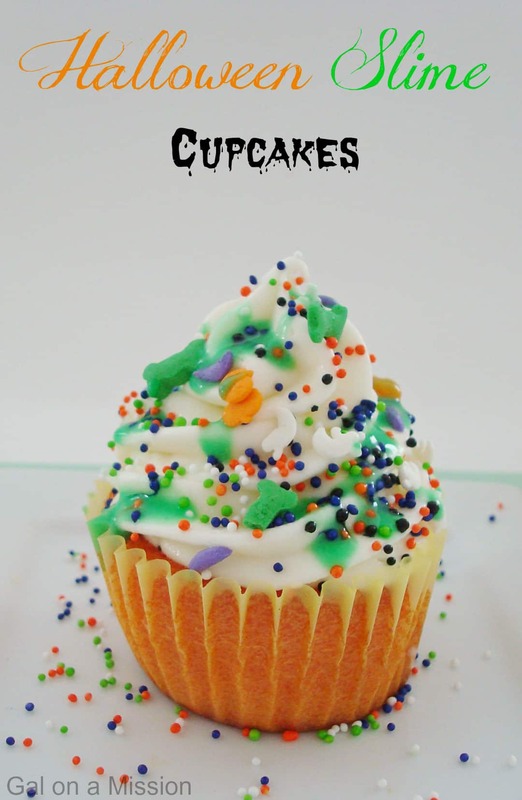 These would be the perfect addition to any Halloween party of just to bring in for a treat at school. Such a cute, fun idea. Preheat oven to 350 degrees and line a muffin tin with cupcake liners. Using a medium bowl, mix together the flour and baking powder. Set aside. Using an electric mixer cream together the butter and sugar. Add in the eggs one at a time, then add in the buttermilk. Add in orange food coloring to get the color you want. Start preparing the frosting by creaming together the butter and cream cheese. Slowly add in the powdered sugar and freeze for 5 minutes. You want the frosting to be sift enough to hold up. 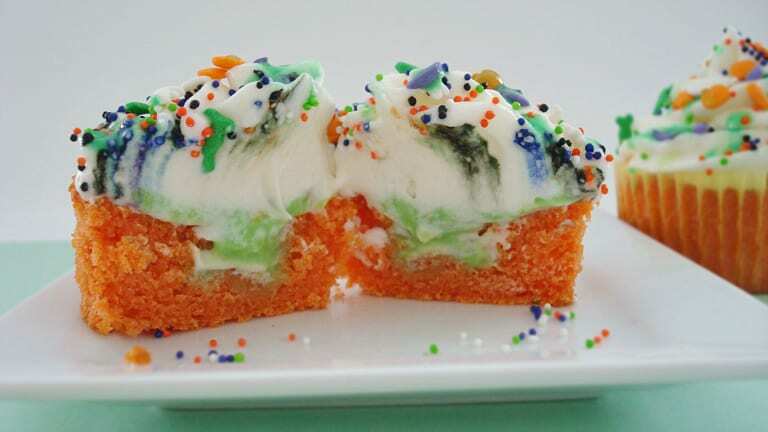 Frost the cupcakes and add Halloween sprinkles and drizzle green slime on top. Perfect silly Halloween treat to enjoy with a delicious cup of milk. I’m putting together a menu for Halloween night for a few of my neighbors that are working moms and will be in a rush that night. These cupcakes are perfect! PS: Do I need to worry about the FTC? wooowww . These cupcakes look awesome .. Wanna have a bite .. Apt for the event running on my blog themed “Lets Celebrate Halloween”. I am pinning this cupcake post!! I am definitely pinning this post, I love the green slime! I may try to make these for my sons birthday at the end of the month! Thanks so much for sharing! These cupcakes are absolutely adorable! Seems easy to make and the kids can help! 🙂 very creative. I love how colorful these cupcakes are! They look delicious and my grandsons would be so excited to eat them! Love this idea for the kids . I love cupcakes and these look soooo cute and good! Yum! How cute! My kiddos would love these!